Barry Greenstein started playing poker as a hobby while studying for a PhD in mathematics after already completing a degree in computer science. With the pro finding himself experiencing a number of victories during his sessions, it soon dawned on him that there could well be a huge amount of money to be made from poker, leaving him with a decision as to whether to move into a career within the software industry or try his luck at the poker tables. In 1991 Greenstein decided that he would begin to work in a software related environment and continue with his poker as a side earner, Greenstein soon found himself winning huge amounts of money, so much money that he was able to leave his regular day job in favour for playing poker on a full time basis. The move seemed to be one that carried a large amount of risk but with Greenstein’s thirst for risk and excitement, this was exactly what he was looking for. We can now look over his decision and can clearly see that the gamble that he took certainly paid off, with an honours sheet that could quite possibly silence a number of the professional poker players in the game today. Greenstein has a host of titles to his name, with the World Series of Poker (WSOP) and World Poker Tour (WPT) been a great example of tournaments that this pro has been able to overcome. During his time within the World Series of Poker (WSOP) Greenstein has notched up over 30 consecutive tournament cashes, with 13 of those been final table placements too. Although he might have a large number of tournament cashes to his name, don’t be fooled into thinking that he hasn’t gone all of the way in the tournament either, winning World Series of Poker winners bracelets in 2004, 2005 and 2008. The World Poker Tour has also provided Greenstein with a great amount of success, making six final table appearances and winning the tournament twice during his career already. The tournament cashes within the World Poker Tour series of tournaments have helped Greenstein to increase his poker career earnings by a further $2 million, meaning that his estimate career earnings reaches $6 million in poker prize money. Not to be a one trick pony, Greenstein also signed up to play within the high stakes ring game action found been played at Bobby’s Room, with a good success rate within that action too, more often than not leaving the game well within profit. Greenstein is considered to be one of the best real money ring game players in the world and with statistics to back up that claim the poker industry are only too willing to allow him to have the respect that comes with that accolade. Barry isn’t selfish with his skills and ability either, opting to offer players from all over the globe a chance to get an insight into his game play and strategies, writing a poker strategy book entitled ‘Ace on the River’. 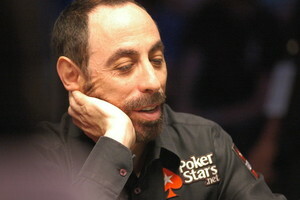 The book proved to be yet another success that Greenstein can add to his growing collection of things to tell his friends, with the book flying off the shelves as players looked to mimic the prolific poker professional, he has even been seen giving away free signed copies to any player who knocks him out of major tournaments.